They’re installing cabinets in a cottage tucked into the woods of Quebec. bottom of the Ottawa River. came from forests that had never been harvested before. Plus, the colors are unique. The lumber has spent decades lying on the bottom of the river. wood has the look of a marble cake. There are stark contrasts between lights and darks. Andy says the reclaimed lumber has changed the way he approaches his work. Andy slides a hand planer along the edge of a door. Tiny curls of wood fall into a pile as he carefully molds the door to the frame. inspires them is the story behind it. on the ice. Come spring, they’d ride the logs downriver. Dave says those men are always present to him while he’s working. 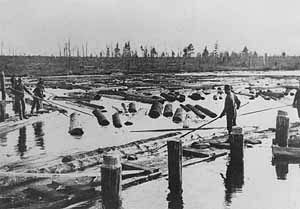 end of the log boom in Canada. That passion influences customers too. Will Lockhart hired the Sharpes to renovate the kitchen in his cabin. The cabin’s an important part of his family’s history. But he wanted it to represent the history of the region as well. And telling them the story of Canada’s lumberjacks. It’s estimated that the supply of reclaimed wood will be exhausted within 40 years. behind a tangible piece of history.